Zero noise, small footprint and low power chassis. The M350 is Industry's smallest universal case (192 x 210 x 62mm , 2.5L) capable of housing mini-ITX boards ranging from tiny Atoms to fully featured desktop or mobile CPUs. The M350 chassis permits fanless operation (natural air convection via hundreds of tiny holes) for TDP < 10 watts and CPU-only fan for TDP <= 65watts. Equipped with hidden (but not shielded) USB docking station for WIFI / 3G / Bluetooth or simply USB flash booting, the M350 is the only enclosure that provides such innovative USB, radio friendly, expansion methods. For internal miniPCI cards or modules, and high gain SMA antenna option is provided on the back of the case. 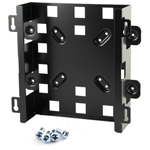 The M350 enclosure features multiple mounting options, making it ideal for industrial applications. The M350 power button can be disabled by means of removing a jumper, thus preventing accidental ON/OFF actions. An additional jumper activates an "always ON after power loss' automatic pulse generator that will startup your motherbaord every time power is applied, regardless of BIOS setting! 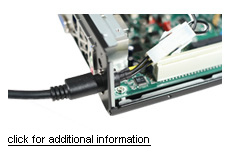 NOTE: Additional fans can be installed on the hard drive mounting brackets or in the front of the enclosure. - Wall screws not included.